Its Debatable Bruh Hip-Hop & Sports Podcast (Entertainment) Episode #30 What's Going On With The Cavs? Its Debatable Bruh Hip-Hop & Sports Podcast (Entertainment) Episode 12 Colin Kaepernick and Chris Brown Frenzy!!! Its Debatable Bruh Hip-Hop & Sports Podcast (Entertainment) Episode #29 LeBron James Vs Giannis Antetokounmpo ...Who's The MVP? Its Debatable Bruh Hip-Hop & Sports Podcast (Entertainment) Episode #27 Zeke Elliott Gets 6 Games...But WIll it Stick? 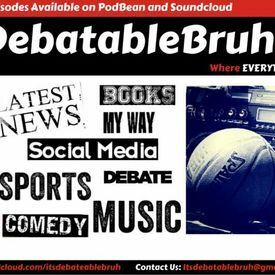 Its Debatable Bruh Hip-Hop & Sports Podcast (Entertainment) Episode 9 Hip-Hop and Sports As we always Promise!!! Its Debatable Bruh Hip-Hop & Sports Podcast (Entertainment) Episode 1 Game 7 NBA Finals LeBron James Gets it Done!!!!!!!!! Its Debatable Bruh Hip-Hop & Sports Podcast (Entertainment) Episode 4 Kevin Durant Signs with the Golden State Warriors!!! Its Debatable Bruh Hip-Hop & Sports Podcast (Entertainment) Episode 2 Derrick Rose Traded to The New York Knicks!!!! Its Debatable Bruh Hip-Hop & Sports Podcast (Entertainment) Episode 3 Ben Simmons Goes #1...Can He live up to the Hype? Its Debatable Bruh Hip-Hop & Sports Podcast (Entertainment) Episode 6 Is The Eastern Conference Back!!!? & Is Drake Afraid of Budden?